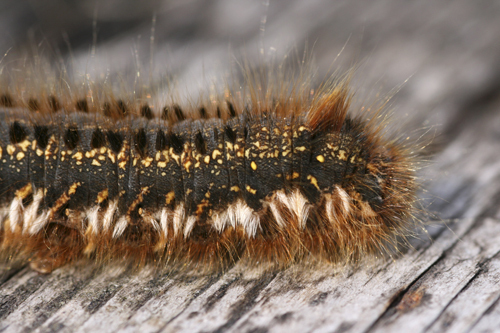 MNA coach trip with 20 members visiting the South Walney Reserve run by the Cumbria Wildlife Trust. The area consists of a shingle island with lagoons where salt, sand & gravel were extracted during the 19th and 20th centuries. As our coach driver negotiated the single track road and speed bumps to we had our first sighting of a Cuckoo looking very raptor-like from the coach window. 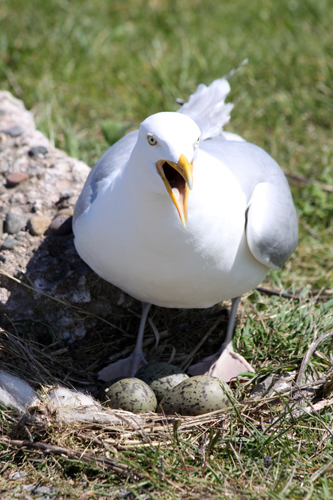 We had been previously warned about the likely attack from the large numbers of Lesser Black Backed and Herring Gulls that nest on the reserve. The majority of the breeding colony was now protected behind an electric fence but we still had to run the gauntlet past a few nesting pairs. 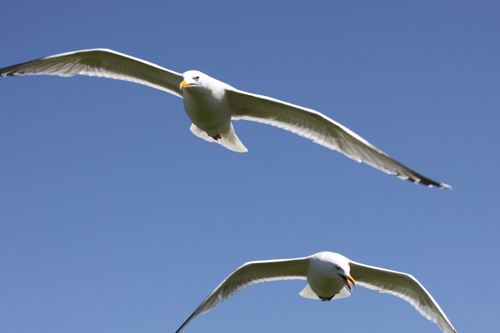 One pair of Herring Gulls having chosen to nest almost on the track itself! 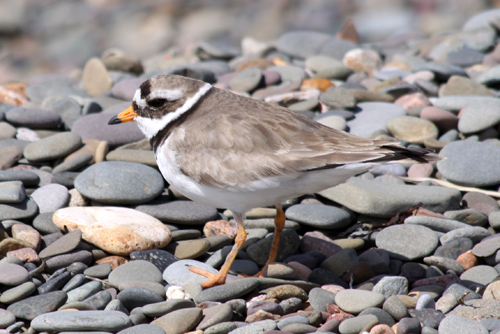 A few Ringed Plovers were nesting on the shingle close to the track, one bird running off to draw attention away from her nest of three speckled eggs. 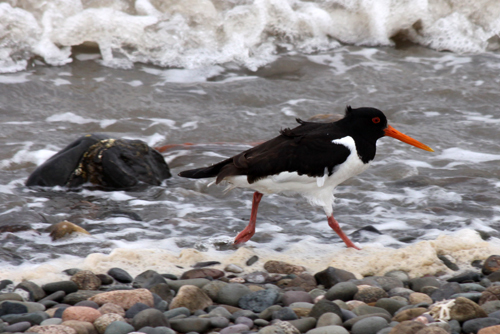 A few Oystercatchers were running along the waters edge. We had seen a number of Greylags on the edge of the Reserve but two more unusual Geese caught our attention. They were Emperor Geese. These are the descendants of captive birds who escaped from Piel Island and have bred successfully here. 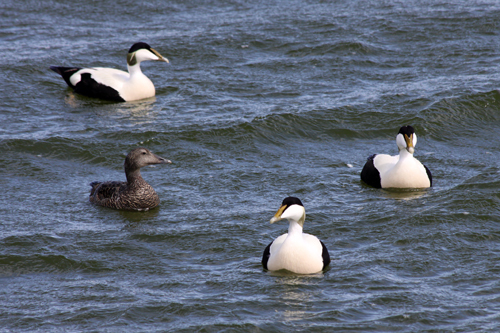 Another big bird draw was the many Eiders Ducks, the males outnumber the females 10:1 so there is a lot of competition to impress the ladies. 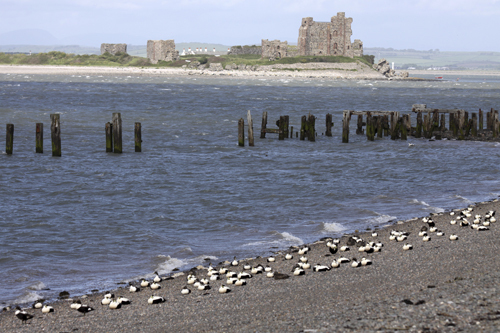 A few Eiders were battling the waves caused by the ferocious windy conditions and a large gathering resting on the shingle bank with the atmospheric backdrop of Piel Castle. 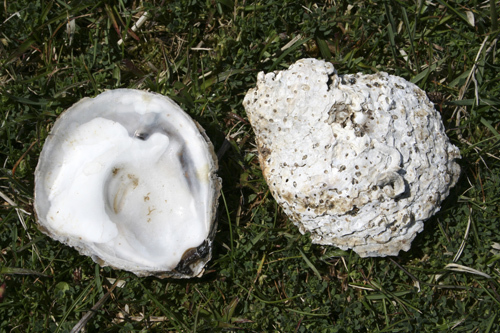 I had a wander along the track that runs to the Seasalter Pacific Oyster Crassostrea gigas hatchery / nursery in the old extraction lagoons and found a few discarded shells. The tide was heading in as we continued south along the trail. A huge flock of Oystercatchers were resting on the edge of the saltmarsh amongst them was a leucistic bird i.e. one with reduced pigmentation causing some of its normally black feathers to be white. Shelduck and the odd Curlew were out on the marsh and a few Grey Seals were bobbing about in the water. Those that reached the Sea Hide were rewarded with views of Arctic and Sandwich Terns, distant Gannet and Manx Shearwater. A few members watched a dark Peregrine fly in from the sea just as a shower had passed overhead. 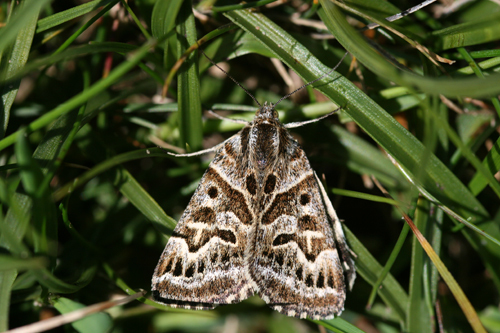 John Clegg and co. watched a Brown Hare as it came and sat in the thick grass just in front of the hide. 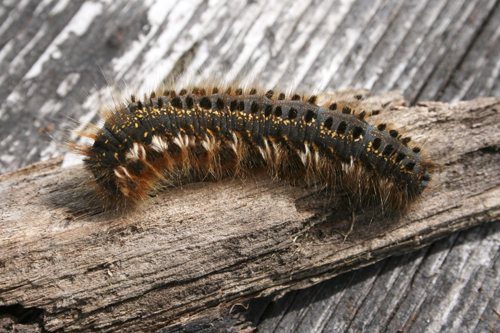 Moths seen included a Magpie Moth Abraxas grossulariata escaping the wind in one of the hides, a Mother Shipton Moth Callistege mi hunkered down in the grass and half a dozen fat and hairy Drinker Moth Caterpillars Philudoria potatoria. Plants included Houndstongue Cynoglossum officinale, Germander Speedwell Veronica chamaedrys, Silverweed Potentilla anserina, Common Stork’s-bill Erodium cicutarium and Bird’s foot Trefoil Lotus corniculatus. This entry was posted in MNA reports. Bookmark the permalink.